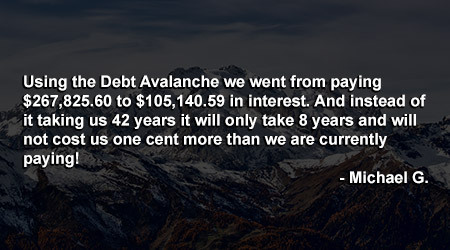 Are you interested in becoming one of Debt Avalanche’s Registered Money Coaches? As a Registered Money Coach, you will have the opportunity to help people grow their finances. Recovery - Scarcity to Stability - Remove chaos and establish order. Repair debt, make life cheaper, learn to plan, understand communication, and more. Strategy - Stability to Security - Transform an idle situation into a productive one. Learn to budget, repair credit, develop financial responsibilities, etc. Prosperity - Security to Success - Go from slow-growing to the start of financial freedom. Optimize accounts, master taxes, understand investing, and fund retirement, etc. Legacy - Success to Significance - Make an impact in the world around you. Establish greater net worth, give abundantly, inherit greater, etc. Highly relational/enjoyable work – We help people transform their lives. Significant income generating ability – Registered Money Coaches are paid well. Coaches can make into the hundreds of thousands of dollars per year. Flexibility in work schedule – You make your own hours. You can work from home, from an office, or on the road – With several methods of communication, you can coach clients anywhere in the world! Very low overhead – You can operate your own coaching practice without lots of money out of pocket. In fact, if you have a computer with internet access, you can operate your practice. Variety of income streams – Depending on the direction you want to go with your practice, you can have one, a couple or many different income streams.